Shabbat is always known for being a time of bonding and closeness, but as usual the Shabbat on Chesed Mission exceeded expectations. Throughout Shabbat we bonded, sang songs, relaxed, and just had fun. We heard Dvrei Torah from Middle Division Principal Rabbi Hertzberg, Susan Franco, and Rabbi Besser. On Shabbat day, Rabbi Besser did what he does best and gathered us all into a big circle to just sing our hearts out with a meaningful kumzits. Everything we did just felt extra special. 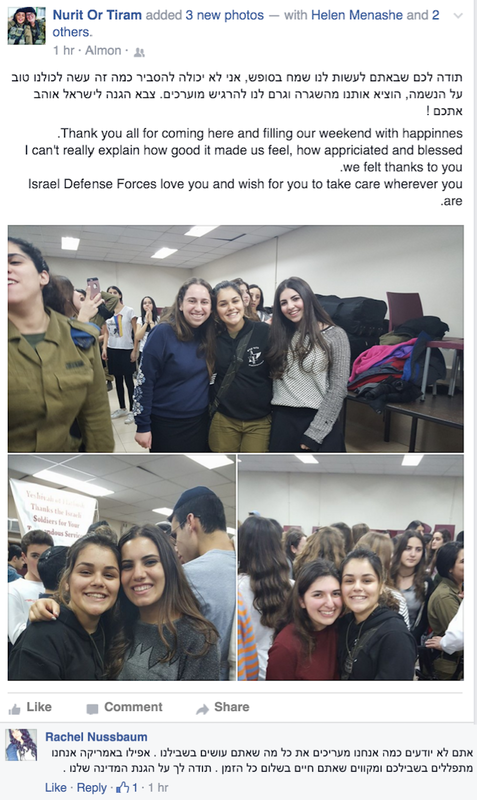 After Shabbat we were off to another night of amazing chesed at an Israeli army base with Thank Israeli Soldiers. As soon as we arrived we were greeted by the soldiers who fight for our homeland every day. They were happy and extremely grateful that we had come to just say thank you! We sang and danced with them the whole time. As the night was coming to a close we gave out gift bags with necessities just as a small token of our appreciation for what they do. "We cherish the moment when you guys come and visit us- it makes everything we do worth it." One soldier actually said this to one of us tonight, and the feeling we all got was indescribable. All in all it was truly an inspirational day that none of us will forget!